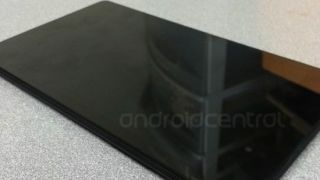 Nexus 7 2 details continue to spill, will it flood the market July 31? If you're the type of Android tablet buyer who prefers to be pleasantly surprised by new product announcements, you might want to skip the Nexus 7 2 refresh, which has leaked out from every corner of the internet this week. Engadget reported today that a new model of Google's Asus-manufactured Nexus 7 appears to be on deck for release sometime before the end of the month, with nearly every aspect of the tablet popping up courtesy of various tipsters. Earlier this week, reports claimed the second-generation Nexus 7 would hit stores shortly, with a 16GB model selling for $229 (about £150, AU$248) and 32GB model priced at $269 (about £176, AU$292) - a few clams more than current iterations..
Judging from info made public today, that extra dinero may be worth it, with a quad-core 1.5GHz processor and the elusive Android 4.3 only the tip of this iceberg. According to a screenshot of Nexus 7 2 specifications, this year's model will also include dual cameras: The customary 1.2MP front-facing model for video chat, plus a 5MP shooter around back for taking photos and video. We've heard word on the slate's pair of cameras before, and now the inclusion of the snappers is looking pretty set in stone. The 32GB tablet also promises wireless charging and Slim Port video output for enjoying as many 1080p HD videos as you can cram into the available space. With a Google event planned for next Wednesday, the only real questions left are: When and where can we buy one? An Engadget tipster claims the refreshed slate will hit Staples retail stores on July 24, but are likely to be kept under lock and key for a week until July 31. HP may be eying a return to making smartphones, but here's one tablet you should check out.